Pattern making is a rather complex task that involves complex thinking and proper engineering. Pattern makers must be technical and accurate with the patterns that they develop. The garment manufacturing process relies heavily on the pattern maker and their creations. Patterns are templates used to create clothing, footwear, and fashion accessories. The people that make the patterns are pattern makers. Search for pattern making relevant job categories. You can search for employment as a Pattern Maker, Grader, Fit Model or Marker Maker. More Educational Information about: Patterns, Marking, Pattern Design, Plotting, Material Utilization, Pattern Making, Grading, and Marker Making. Review the listings below to find a wide variety of clothing pattern makers. Find a professional pattern maker to assist you with your next project. Ace Apparel (Korea) Address: 501 Baegun Bldg. 84-39 Sangbong-dong, Jungnang-gu, Seoul, Korea Phone:82-2-2209-5915 Fax:82-2-2209-7636 E-mail:apparel@pattern-cad.com Contact : Mo Duck Won Founded in 2001, Pattern-cad.com uses special CAD equipments for clothing products to provide pattern design, grading and marking services to vendors in the US, Japan and European countries. They have patternmakers with over 20 years of experiences. These patternmakers design almost every basic pattern for knit, denim, children's wear, women's wear and men's wear on the basis of the sketches provided by buyers. By using CAD according to the required specifications, the patterns can be produced, edited and maintained per each size. These patterns are placed in their database for management. They perform operations by using OptiTex, Gerber, Lectra, Auto CAD and illustrator, etc. The patterns are either sent through e-mail to theircustomers or can be downloaded through website for actual size printing. Author of "Guide To Starting a Fashion Company" with great reviews. View a video from Cherie Bixler. Fashion Pattern Making Ltd (Italy) established to propose, to interested manufacturers, Italian fashion collections draws by Italian Designers. The Co-operation with Cristina Scarciolla and Gianpaolo Ferrara, two excellent Italian fashion designer, make them able to satisfy a large demand on the apparel market, starting from pret-porter to high fashion. Their target are all manufacturers that need to propose to their customers a genuine Italian fashion style. They are able to draw a complete exclusive collection, including test-models as well as paper-pattern only. This company is based out of the United Kingdom, but has their design studio offices in Italy. Learn more on this topic from the information below. 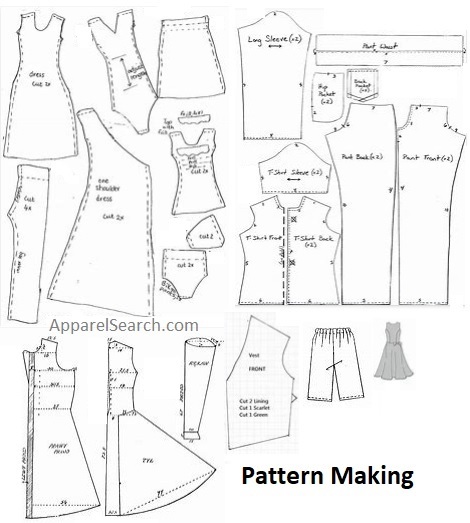 Fabric and apparel patternmakers convert a clothing designer's original model of a garment into a pattern of separate parts that can be laid out on a length of fabric. After discussing the item with the designer, these skilled workers usually use a computer to outline the parts and draw in details to indicate the position of pleats, buttonholes, and other features. (In the past, patternmakers laid out the parts on paper using pencils and drafting instruments, such as rulers.) Patternmakers then alter the size of the pieces in the pattern to produce garments of various sizes, and may "mark" the fabric showing the best layout of pattern pieces to minimize waste of material. Once an item's pattern has been made and marked, mass production of the garment begins. Cutters and trimmers take the patterns and cut out material. They must pay close attention to their work because mistakes are costly. They place multiple layers of material on the cutting table and use an electric knife or other cutting tools to cut out the various pieces of the garment following the outline of the pattern; delicate materials may be cut by hand. In some companies, computer-controlled machines do the cutting. Don't forget to join us for discussions about the technical design of clothing at the Fashion Industry Network. Make sure to join the Pattern Maker Group. By the way, if you need help with manufacturing or pre-production you are welcome to contact our Production Services department for assistance.